At this stage of the game, web soaps are entering a new phase of existence that may give fans a true view of the potential of the genre on the internet. Starting in the late 90&apos;s with the groundbreaking web serial The Spot to Karen Harris&apos; ambitious Life in General and its actual-soap-within-a-soap "Greenville General" to the hilarious Wed-Locked to the wildly addictive Anacostia the Web Series to a brand spanking new radio-style serial called Out of the Gate, soap fans have seen a steady rise in the number of serial choices before them even while broadcast network television soaps are widely acknowledged to be in decline. Unfortunately, the climb of web soaps to what their creators&apos; hope will be creative prominence and hoepfully profitable enterprises has been more than a little rocky with web soap producers relying on barely-there budgets, actors and crew members donating their talents amid ever-shifting schedules, and a severe lack of marketing in what was once a pre-social networking world. However, thanks to Facebook and Twitter (with a distant assist from MySpace) part of the promotion issue is being addressed. Meanwhile, YouTube, Vimeo and other video sharing sites have provided relatively easy (and free) distribution exposure gateways to the masses. 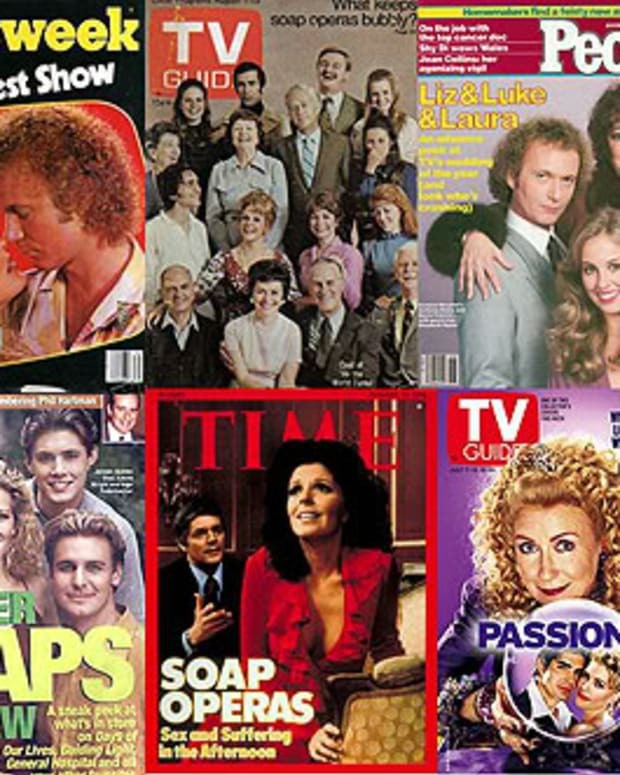 Lately something brand new and very important has been added to this mix to make web soaps more viable than ever: wildly popular current soap stars complete with built-in fan bases helming their own serial projects. This represents a major shift in the online soap paradigm where the engine driving these web endeavors are as famous (and often starring alongside with) the talent in front of the digital cameras. By enlisting their well-known and often beloved actor friends and colleagues as costars in lead and supporting roles, this new breed of soap has the potential to break free of the shackles of network broadcast television and finally prove web soaps viable. On December 4, the most high profile of these efforts will arrive in the heavily hyped, hotly anticipated form of the lesbian-themed Venice, the brainchild of uber-popular Crystal Chappell (Carly, Days of Our Lives) piggybacking off the wildly popular "Otalia" fan base (no pun intended) from the now-canceled Guiding Light. Beating it to the punch is the New York City-based web series from daytime superstar Martha Byrne (ex-Lily, As the World Turns). The first episode of Gotham finds Richard Manning (Michael Park, Jack, ATWT) driving through the streets of Manhattan listening to series of voice mails from, among others, his daughter, Richard&apos;s gravelly sounding mother, a giggly woman, and a man who is clearly not happy about something. Richard is apparently one of those Very Important People with whom lesser mortals have to insert themselves into cell phone photos. Manning is en route to a party, hosted by Catherine (Byrne) at the home of her best friend Tina (Anne Sayre, ex-Mitzi, ATWT). Also in attendance is Catherine & Tina&apos;s "gay," Jayqui (LaMont Craig) — who has an interesting tie to Tina. When Richard makes his entrance, he and Catherine lock eyes in a classic soap fade out moment. End credits. The first thing that is very noticeable is that Gotham&apos;s premiere episode runs just shy of three and a half minutes. I admit to raising my eyebrows a tad because I expected more in terms of time, but I eventually wound up wanting more story because those minutes were used extremely well. If one were to subtract the slightly too long opening credits, there might have been roughly 2 minutes of actual story but Gotham manages to introduce us to characters we never even see on screen (Rachel, Richard&apos;s mother, and maybe Josh?) and get the ball rolling on or suggest a number of possible story lines (I counted about six possibilities), including Richard & Catherine&apos;s. That is what is known as economy of writing and directing and a couple of broadcast soaps could learn a thing or two from from it. Finally, the acting is uniformly good, too. It is too early to tell exactly who these people are in the grand scheme of things, but it is easy to see that all of the actors are fully inhabiting their characters out of the gate, which is no small feat. If there is one weakness, the relationship between Catherine, Tina and Jayqui (was that lip gloss?) seems borderline cliche but that too is a quibble for now until we see things shake out. Otherwise, it is a kick seeing Park out of Jack Synder/Bauer mode and Byrne literally radiates off the screen. Given it&apos;s short running time, Gotham&apos;s debut felt more like a teaser or a preview than a fully fleshed episode but perhaps that is all which is necessary to get the the party started, so to speak. Creator and star Byrne is an unabashed fan of the soap genre, having not only spent the better part of twenty years as Lily Walsh on ATWT but also recently as a script writer for The Bold and the Beautiful and a short acting stint of General Hospital as political viper Andrea Floyd. She knows a thing or two about how soaps work and it shows in the little taste of things to come that Gotham promises in the opener. Despite some nods to what is au courant (unconventional friendships, an out gay character, etc. ), Gotham has an old school feel to it, influenced no doubt by Byrne&apos;s years with a Proctor & Gamble franchise. This influence is underscored by co-writer and director Lisa Brown (ex-Iva, ATWT; ex-Nola, GL), whose tight & confident direction bodes well for the series. Three and a half minutes might not seem to be much to go on, but Gotham shows a lot of promise. Now it&apos;s time to see if it delivers. Sisters Clash and Time Runs Out on Gotham!